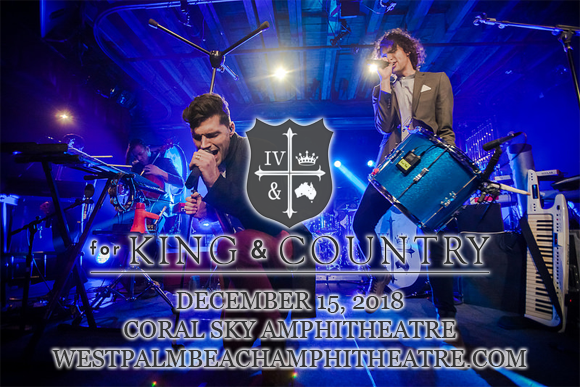 Celebrated Christian pop duo For King and Country comes to Coral Sky Amphitheatre on Saturday 15th December 2018 on their Little Drummer Boy Tour! The brothers, Joel and Luke Smallbone, qare taking a holiday spectacular on the road, matching their anthemic music with the true meaning of Christmas for a show that will be out of this world! Book your tickets now to see this two-time Grammy Award-winning duo live! For King and Country is a Nashville-based Christian pop duo, which was formed by Australian brothers Joel and Luke Smallbone in 2007. The duo released their debut EP, A Tale of Two Towns, in 2008, leading to a record deal with Warner Music Group in 2009. For King & Country: The EP was released in 2011 and its leading single "Busted Heart (Hold On To Me)" brought them to public attention, peaking at number 3 on the Billboard Christian Songs Chart. One year later, the brothers released their debut studio album, Crave, hitting number two on the iTunes top Christian & Gospel albums on its day of release and number 42 on the overall chart, as well as peaking at number four on the Billboard Christian Albums chart, remaining on the chart for 41 weeks. Their second studio album, Run Wild. Live Free. Love Strong. (2014), hit number 13 on the Billboard 200 and was certified gold by the RIAA. Their third studio album, Burn the Ships, is due for release in October 2018.